This WP studies the spontaneous emergence of regular spatial order from optomechanical nonlinearities in cold atomic ensembles as well as quantum degenerate gases. 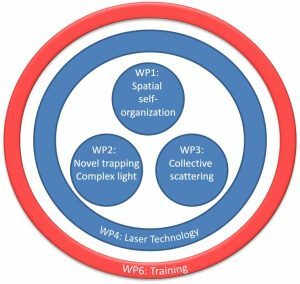 This WP advances light trapping tools for application in quantum information technology realizing complex, unconventional and disordered potentials and to store information in quantum coherences. This WP addresses phenomena of collective scattering and interaction of dipoles emerging at high optical density due to the interaction of many atomic dipoles. Two leading European laser manufacturers will advance the performance of Ti:Sapphire and semiconductor laser systems.